Tired of wussified worship music? Are you tired of worship music being so girlie? So gentle? Have you ever wished for great music with theological depth and interesting lyrics? Wouldn’t you like to find a new album that sounds better the louder you crank it up? Sometimes music shouldn’t just stay in the background. The Living Creatures Project is not another “paint by numbers” strummy acoustic and jing-jangely echo electric guitar production clone. This is not another whiny, worshippy collection of (un)original songs by a worshipster with daddy issues wearing skinny jeans. There’s nothing wrong with the worship music equivalent of a nice candlelit bubble bath – sometimes it can be very nice – romantic and relaxing even. Here’s the thing, following Jesus is not always sleepy, gentile, nap time. Some moments call for some aggression, some volume; sometimes I need some heavy inspiration. I made a album of 12 worship songs with these thoughts in mind. Join us in our revolution to worship out loud. The one in which we speak of Guitar, Bass, and Lead Vocals. The solid foundation of a great drum track is important because there has to be something on which to build everything else. It’s what gets built on top that either makes or destroys the project, though. The guitars, keys and especially the vocal is where the listener is either going to accept this new creation into their heart, or reject it and send it into outer darkness. It was time to find out what this record was actually going to be when it grew up. Armed with a basic scratch track of acoustic guitar and vocal, a click track, and Alan Doss’s solid rock drums; I went into my home studio cave and began layering tracks. I could hear in my imagination how I wanted the songs to sound and I started building those performances one track at a time. It’s slow work, and I would spend much of the next year sitting in my armless office chair in front of my iMac. You won’t believe how I recorded guitar and vocal. Whoa! Okay, maybe you will. I started with electric guitar. This is where the songs started to take their sonic shape and move from imagination to the real world. I put a “telephone EQ” on the scratch track so it took up less space in the mix and I could turn it down and mostly listen to the drums. I didn’t want to be influenced by the rhythm choices I made on the acoustic guitar when they were different from the drums. I wanted to able to lock in with what Alan had played. I needed to hear the scratch track, though, so I could easily tell where I was in the song at any given moment; whether it was verse one, chorus two, bridge or instrumental breaks. The more I could just play without thinking, the better. I dialed up vintage guitar sounds and started hammering away. I like to record dry and add effects later unless the effects are crucial to how I will play the part. I also recorded all of the guitars direct in case I wanted to re-amp something later, but I didn’t end up needing to do any of that. I doubled all the guitar parts as I laid them down, which means I would record each guitar part twice; usually panning on hard left and one hard right. I did this with the intension of choosing what would be doubled and not doubled in the final mix. I used a lot of drop-D and drop-C tuning for the heavy guitar parts; these where usually Les Paul doubled with a Tele sound. The cleaner guitar sounds were often Strats doubled with a Les Paul or a Guild hollow-body sounds. Amps were a combination of high gain Marshall, clean Fender, and mid gain Dr Z sounds. My process for recording guitars is to play along with the track until I feel comfortable with the part and have the right sound dialed in. Then I’ll record a take, not paying too much attention to whether it is perfect, just getting it captured; I might punch in if I make a really big mistake like going to the wrong chord or something. Then I’ll listen to the track to hear if it sounds like I thought it would. Many times the tracks don’t come back to me through the speakers the way I thought I laid them down; they feel different to me when I listen to the playback than when I was playing the guitar and recording. This is where a producer can come in handy; someone to help discern what works and what doesn’t; when something is good but could be better, or when a particular take is magic and should be left alone. This can be a strange world of second-guessing and self doubt. Usually, I like to record alone. I can imagine perfectly in my mind how I want it to sound and it’s just a matter of comparing the track I just recorded to the imaginary track in my mind. The problem is I need silence to hear the music in my head. When people are around they tend to fill that glorious silence with speaking. When it is only me in the studio, running the gear, playing the parts and listening for the best takes sometimes things can get past me. I’ll admit that sometimes I don’t notice glaring mistakes until the next day or until I start to add another instrument. Maybe there was a technical glitch, a tuning problem or some other mysterious gremlin. I know I’ll find these problems eventually and then I have to go back and record them again. The risk is worth it, though. I have to get into a creative, musical, childlike state when I am recording. This is why I like to work alone. If there are other people in the room it’s too hard to let my defenses down; it’s too hard to let the walls down. People want to have small-talk, make jokes, say clever things, justify their presence; they can make me feel insecure or like I have to prove something. If there is a person running the gear for me I have to talk to them and be polite. On the other hand, the computer doesn’t need me to be diplomatic; I can start, stop, record, delete, edit; all without hurting its feelings. Don’t misunderstand me; I have had really good experiences recording with other people, too. Sometimes people can pull a better performance and help take the songs to places I wouldn’t have thought of. Sam Taylor is great at this; he would feed me confidence and push me beyond my comfort. He would steer me to musical choices that wouldn’t occur to me on my own. As a songwriter and arranger himself, he would paint the canvas of the song with performances of musicians and singers; one part therapist, one part magician. After I finished all my electric guitar tracks, not including solos, I started recording the bass. I would usually not recommend the songwriter and guitarist to also record the bass tracks. It can make the record too one dimensional. Usually guitar players don’t think like a bass player and they will either be too busy (like a noodling bombastic guitar solo) or they are too simple (boring whole-notes with no melodic groove). Guitar players usually don’t know the subtle intricacies of how to extract true tone from the bass strings, or how to mute the strings that are not being played. There are a thousand reasons why you should only use a professional bass player who knows their way around a studio session. My problem is I’m too opinionated about my own songs. It is far easier for me to just play it myself than to explain what I want to someone else. I just have to recall the bass player that lives deep in my subconscious. He lives there so he doesn’t have to pay rent; he’s a bit of a freeloader. Years ago I was the bass player for the band Love in Grey, and I have pretty strong opinions about what bass should do in my songs. I have strong feelings about how it should sound, too. Also, the look on the bass players face while he is playing, and how he holds his tongue. I want the bass to groove with the drums, lead the chord progressions, and stand on its own as a melodic foundation of the song. In other words, if the bass track is soloed, you should still be able to tell what song is playing. For acoustic guitar I recorded my Taylor through an AKG tube mic. Most singer-songwriters who play acoustic guitar on their records think the acoustic is too important. Usually they overplay; over-strumming big full chords as if they are performing a solo concert. I like to record the acoustic guitar so it fits neatly with the drums. The last of my guitar parts were the guitar solos, and guitar solos are strange beasts. I like a guitar solo to add some melodic energy and interest to the song, but not so much that it is gaudy and gross. This is another area where it can be overdone and distracting or underdone and boring. Recording lead guitar is the same process; I hear how I want it to sound in my imagination, then I lay it down, listen, and record again until it works. In some cases it will be the first take, and it others I will record the solo over and over for days until it feels right. Then I might come back a few weeks later only to hate it and redo it again. The point isn’t to make a perfect record; it’s to make a record that doesn’t have any cringe moments. In some ways I’m just trying to make an album that I won’t regret making. How’s that for a lofty goal? At this point I had my electric guitar, acoustic guitar, and bass tracks along with Alan’s drums. The project was starting to take shape and I could turn it up LOUD and listen to the basic tracks. It was sounding really good and I was getting very excited about how this record was turning out. Two of the songs were mostly driven by keyboards in some parts, and all I had recorded in those parts was the scratch track acoustic guitar. I am not a great keyboard player, but I needed to lay down something that could point a real keyboard player in the right direction. I recorded the main piano parts on “Jesus Give us Love” and “Make Everything New” just to have something to show what the songs should sound like. Amazingly, on “Jesus Give us Love” the final album version is still my piano performance. Every instrument and every layer of an album is important because all the tracks build on each other, but there is one that is more important than all the others. It’s the part that, if it is not right, no one will ever want to listen to the album. I’m talking about the vocal, of course. Many an album project has been ruined by the addition of a bad vocal track. Like a chocolate wedding cake that gets puked on in the kitchen and they try to serve it anyway by scraping off the vomit with reverb and auto-tune. We are all ninjas at listening to the human voice. We can hear if it is out of tune, fake, cheesy, passionate or dull. Most people can’t explain why they prefer one vocal over another, or articulate why they think this singer is better than that singer. They have watched American Idol and The Voice, but they would have no idea how to help a mediocre singer become a great singer. Because we use our voices to communicate, in our subconsciouses we reject bad vocals as quickly as we would pull our hand out of a fire. I’m not talking about good vs bad like Mariah Carey vs Bob Dillon. Many people will prefer the honest, raw singing of a Bob Dillon over the glossy, polished perfection of a Mariah Carey. That’s only one of the many ways we categorize vocals, though. Others include music styles; opera, country, blues, rock, gospel, too heavy, too soft, too much streaming, or too much rapping. We can reject a singer because of their attitude, tone, accent, language, message, whether they seem too happy, too sad, too serious or too angry. We can reject a vocal because of the way it was recorded, the way it was mixed, and a million other reasons. There have been many times that I have started listening to something I haven’t heard before; at first it seems cool, the music is interesting and everything is fine until I hear the singer; I will usually reject something new primarily because of the singer. 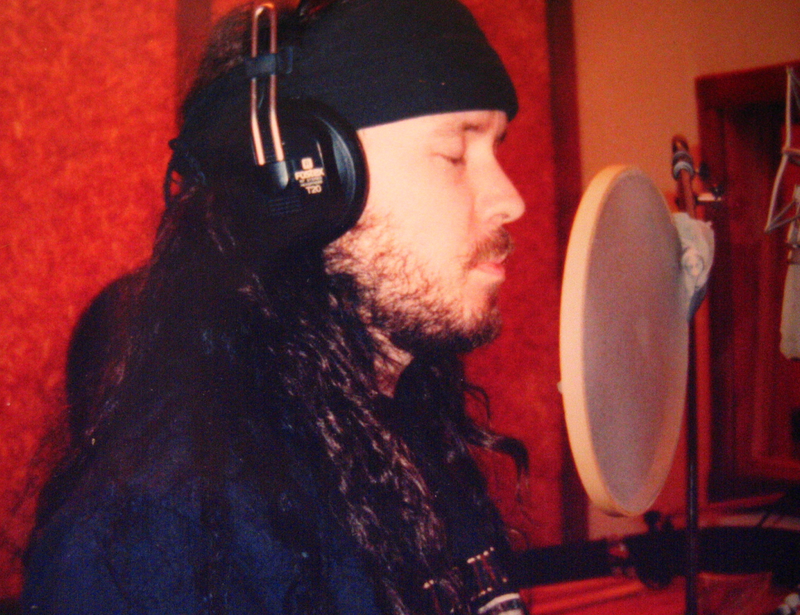 So, recording the vocal on an album it is a humbling and daunting challenge. The lyrics have to be right, the gear has to be working perfectly, I have to be healthy, awake, at my best, in a good mood, focused, warmed up, not worn out, familiar with the material, and up for the challenge. The room has to be quiet, and all the other distractions of life have to be ignored. One of the most challenging things to get right is the headphone mix. Headphones can put pressure on my inner ear and make me think I’m singing in tune when I am not, which stinks. I have to use open cupped phones, which means I have to keep the volume really low, or the drums and instruments will bleed into the vocal track. It always takes me a long time to get comfortable enough to get the first good vocal track. Once the gear and the room are ready, then I record a take; I listen to it to see if it comes back to me the way I thought it would. In the vocal this is even more important than with the other instruments. There is so much nuance with the lead vocal; everything from intonation to whether or not I am smiling while I sing; how much rasp, throat, moisture, sibilance, consonant, breath, air, or vibrato to use at any given moment. How loud to sing? How soft to sing? How to pronounce the words when singing as opposed to speaking, the shape of the vowel, and so many more details. Once again, it is a matter of honestly listening to the vocal recording and hearing whether it should be done again. This is usually a fantastic time of self loathing and great tribulation. Many days I would record ten to twenty takes of a single song, each technically without mistakes, but with slightly different approaches, only to come back later the same day or the next day and start over. No kidding. The lead vocals are where the majority of my time was spent recording this album. There are lots of ways to approach recording, and this is just mine. The end goal is to capture an honest recording of someone’s musical vision. Music is the art of human emotion expressed as sound; recording is the art of capturing the best possible performance of that expression to experience later. Trapping emotion in a digital box; no one said it was going to be easy. The One in Which I Tell Tales of Hiding Songs in Dark Places and Recording Drum Tracks. The other day my son, Angel told me he wrote a song and asked me if I wanted to hear it. I said I would love to hear it, but first I want you to write four more songs. Write four more songs, then play me the best of the five. I explained my reasoning; when I write a song, at first I always think it’s the best song I’ve ever written and usually I have to write a couple more songs before I have any objectivity. It’s like our kids. When we have the first kid there is a magic filter that causes us to believe they are the most wonderful child in the world; they are the most beautiful (so beautiful we take nine photos every hour, and show the photos to anyone who will stand still long enough to see them), they are the most talented (everything reminds us of another amazing story of teething, sitting, crawling, walking or baby talk illustrating how our child is well above average.) The filter even works on other people; no matter what they say we only hear what the magic filter lets through. Someone could say our baby was a hideous little worm, but we would only hear, “Your baby is so adorable!” Once we have another child we start to see the first kid more objectively; the magic filter stops working, and we begin to see our kid for who they really are; a hideous little worm. Just kidding! Whether parents have another child or not, we eventually start to see our child in a more realistic light. Well, most parents anyway. Songs have a magic filter, too. If it wasn’t for this magic filter, most of us would never write a second song, and we would have hidden the first song in a dark place where no one would ever find it. This is where the child analogy completely breaks down, of course. Parents should never hide their children in dark places, no matter how awful they are. I’m going to back slowly away from the “songs are like children” metaphor before someone gets hurt. I needed to cut eight songs from the Living Creatures Project from the twenty I had started with. These had already been chosen from about a hundred songs, so it was really a matter of choosing songs that made a cohesive album rather than cutting the hideous worms. Songs like “Open Your Word,” “Christ the Word of God,” and “He is Risen” along with some renovated hymns will probably resurface on a project in the future. We recorded the drums at Alan’s studio. 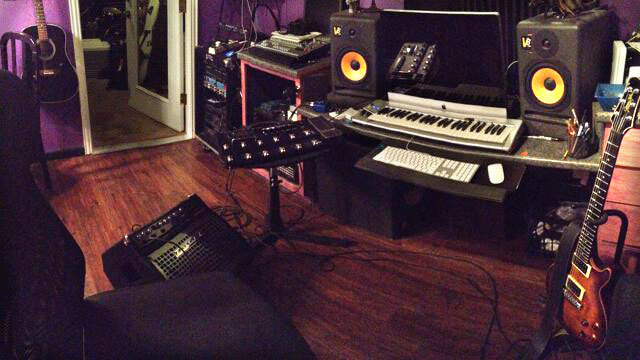 He has the control room set up in a small bedroom, and he ran an audio snake across the attic to a larger bedroom he uses for the recording room; the place where he keeps his drums and music gear. The control room is dark with a black futon and a colorful disco light that reacts to sound. There is not a window between the control room and the recording room like you have probably seen on TV, which can make communication between the two rooms challenging. We ran everything through some crazy cool analog gear with old transistors and tubes to give everything a nice warm glow, but eventually the signal gets captured digitally on a MacPro running ProTools. 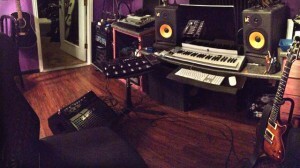 I sat in the control room and ran the software while Alan played drums in the other room. Before each song he would come into the control room and sit on the futon while we listened to the scratch-track. We would both play the drum parts by tapping our foot for the kick and slapping our legs for the rest of the kit; pretty much like two kids playing air-drums. 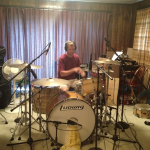 I knew the basic drum parts I wanted for the songs, and this was a great way for us to get on the same page quickly. Once we had a plan for what the drum part would be; where to play, where not to play, what the groove was going to be, where the fills are, what kind of fills, how busy or minimalist the drums should be, etc. then Alan would go into the recording room, put on headphones and start hammering away at the track. I would record everything, because you never know when a happy accident might occur. Usually he would play a couple takes before he wanted to listen to a playback. Sometimes when you hear the playback it doesn’t come back through the speakers quite the way you thought it was going to sound, so you record again with slight modifications. The goal is for it to feel the same when you listen to it as it did when you were playing it. Typically by the third or fourth take we were ready to move to the next song. 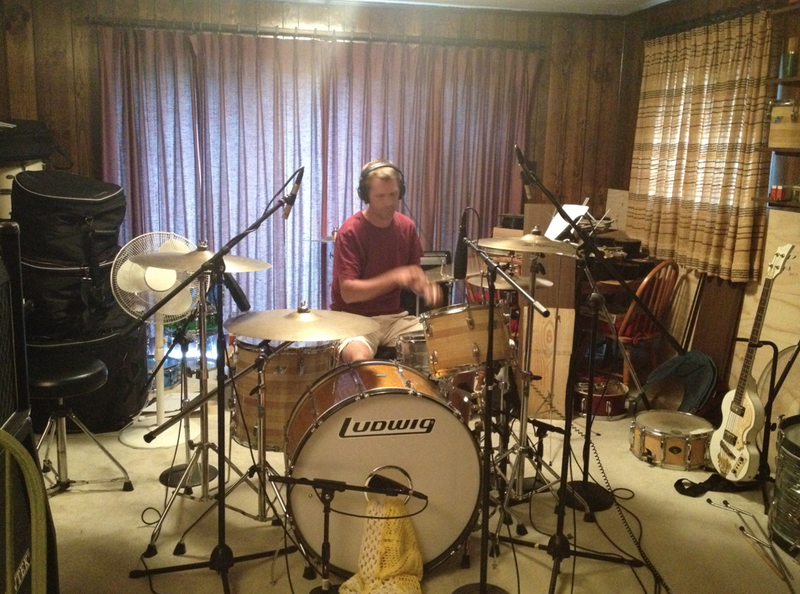 If I remember right, I think it only took us three days to lay all the drum tracks. I think Alan is a genius drummer who knows how to play drums like a composer; he finds the perfect part to set up the song and make the arrangement come together. He is a bit of a minimalist but he has serious rock chops when he needs them. I’m pretty sure he can read minds. It felt great to have the drum tracks finished. He made stereo mixes of them, and uploaded them to Dropbox so I could load them on my computer and work on guitar, bass and vocals at home. Frank Hart turns listeners into believers with his album, The Living Creatures Project. 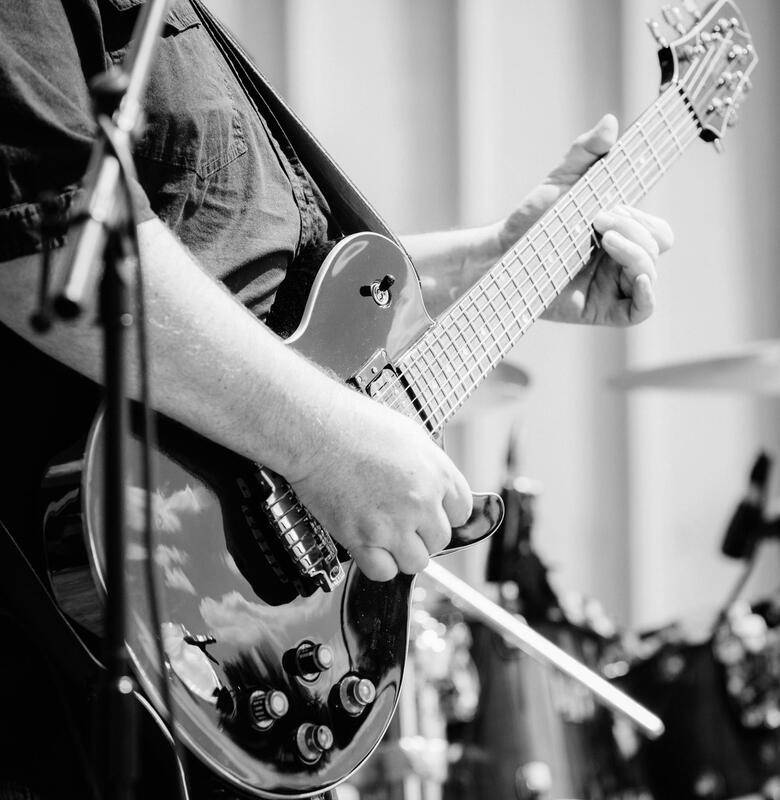 Hart, the lead singer, songwriter, and guitarist of the rock band Atomic Opera, penned this long-awaited release as the worship leader at CrossPoint Community Church in Katy, Texas. He delivers the same soulful flavor here as he does in a smoky pub on a Saturday night and in church on Sunday morning. He is a master of uniting his music, his faith, and his worlds into one faithful experience that rocks to the core. The album is somewhat bookended by the soothing rock-a-bye “Jesus Give Us Love” and the disarming keyboard chords in “In Jesus’ Name Believe,” but the tracks between them pack a punch. 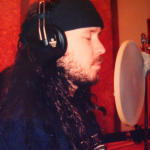 In the permeating rock song “Christ Before Me,” Hart layers his low, haunting voice over a long, mystic guitar ride. “Three Days of Darkness” dares to journey from the depths of doubt to the heights of assurance: It begins in eerie stillness and slowly swells before it bursts wide open to the triumphant claps and chants of the Salvation Army Harbor Light Choir. 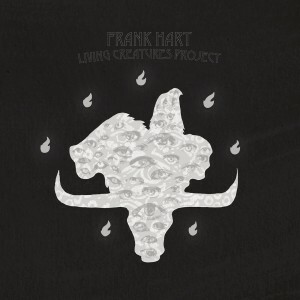 By the time the album recedes into its final track, “Blessed to be a Blessing,” listeners will surely recognize the blessing of Frank Hart and The Living Creatures Project.